Ready to Live More Free and Alive? I used to have to spend 30 minutes a day on a nebulizer, once in the a.m. and again in the p.m. but after my 12th salt session, I have stopped using the nebulizer completely. I arrived with a head cold and left with my sinuses feeling much better. I have decided that I prefer the Qi Garden to treat head or chest colds rather than a visit to the doctor’s office. The Qi Garden is much more pleasant and costs much less. After 45 minutes of breathing in the salt diffused into the air, we felt extremely relaxed and refreshed. Both my friend and I could attest to a wonderful night’s sleep after just one session. My time at the Salt Spa was a great experience. When I walked into the salt room it was amazing – I’d never seen anything like it before! After my salt sessions I noticed how good I felt, especially since I experience quite a few health issues. The eczema on my arms cleared up and it seemed to help my asthma. It’s a great experience and a great help. So relaxing and centering. We’ll be visiting agin. Namaste! First time user. Go after a massage! It was wonderful to have more quiet and relax time. It’s like I could feel the toxins working their way out of my body – a lot of sweating. I am breathing better and am sooooooo relaxed :0). I will be back soon! Thank you. I can breathe again. And snoring is allowed. Thank you. Brought my whole family! [Qi Garden note: this is during child specific times.]. My 2 &. 4 year old loved playing with the toys & finding the hidden rocks. Would do it everyday if we could!! Loved it :0) ! Tell us what you think and we’ll post your Testimonial here! I have stopped using the nebulizer completely." The Qi Garden Salt Spa is a unique new therapy center located within The Wellness Spa in Stevens Point, Wisconsin designed for people suffering from respiratory difficulties, skin issues, high stress and lack of sleep. 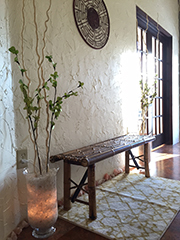 Through Speleo/HaloTherapy, a microclimate of dry saline aerosol therapy, the Qi Garden can offer a 100% drug-free treatment to treat the upper and lower respiratory system through a relaxing, non-invasive treatment that is safe for every age group; including children, pregnant mothers and seniors. Improvement can be felt after just one 45 minute visit to this unique environment where salt covers the walls, floor and saturates the air. Chronic and acute lung, sinus, and skin issues can be improved in just 3-20 treatments depending on severity. Get relief with our Restorative Integrative Treatments in our Restore Room, with four different therapy options to aid those affected by respiratory, stress, sleep issues and the ailments associated with them such as depression, anxiety, SAD, insomnia, lack of muscle tone, sluggish metabolism, weakened immune system and lack of desire. 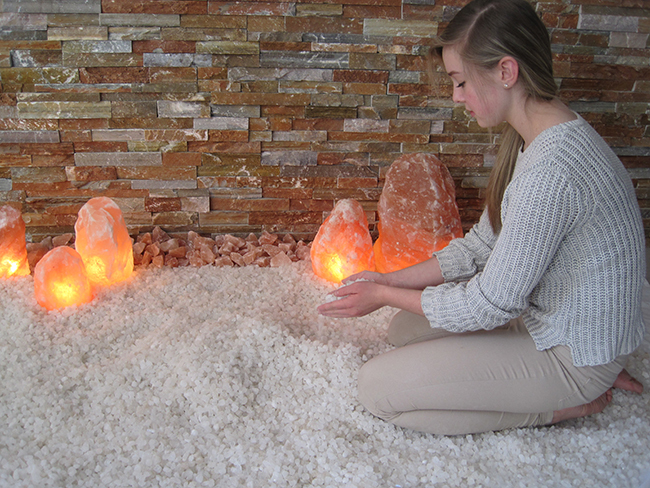 Combine a Salt Spa session with a Restore Room visit for true relaxation and health improvement. The Qi Garden Salt Spa is the first-of-its-kind in the Midwest merging the benefits of Halotherapy, color/light/sound therapy and Restorative Integrative Treatments all within the relaxation of a meditative Zen Garden environment giving our guests “A New Way to Spa” as well as a new option for staying healthy throughout the year. 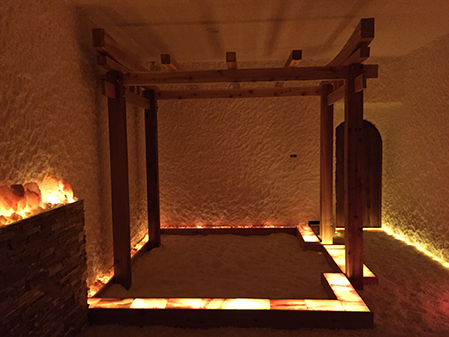 The Qi Garden Salt Spa is a unique therapy center located within The Wellness Spa in Stevens Point, WI offering relief from respiratory difficulties, skin issues, high stress and lack of sleep. Copyright 2014 - 2019 Qi Garden, Inc. | All Rights Reserved | Please note: The Qi Garden Salt Spa provides Healing Experiences that we hope will work for you to enhance and improve life. However, we are not a medical facility, nor do we represent in any way that our products and services should replace medical directives and advice of your physician. Rather, we hope that our services can provide complimentary experiences that work together with your doctor's advice. We encourage you to consult your physician and/or other medical professionals before starting any new treatment program. Purchase Online at www.qigardensaltspa.com or call The Wellness Spa at 715.341.3333.